This is making the email rounds, a link to a mysterious website that just so happens to have a lot of LEGO content as well as copyrights at the bottom pertaining to The LEGO Group. * When you find the contact person, tell them the number of the pod you seek, e.g. ‘Pod No.2’. Be sure to write down the Pod ID. It looks like it’s an ARG (Alternet Reality Game). The person who emailed it to me pointed out work is being done towards a new LEGOLAND in Texas in Grapevine Mills mall (near Dallas/Fort Worth) by Merlin Entertainments Group and that perhaps some of the coordinates match. I’m guessing it has more to do with the upcoming 2010 LEGO sets, given that actual physical work won’t be done at the new LEGOLAND site until a good 8 months from now, and it won’t be open until 2011. That’s an awful long time to be running an ARG. 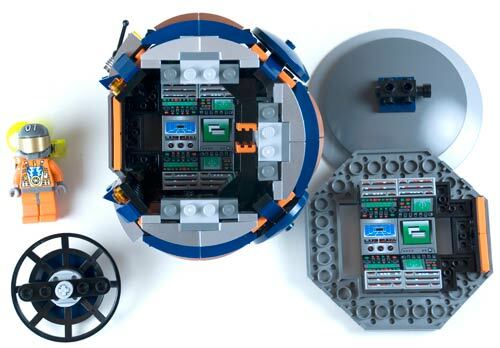 Plus, the latest POD is supposed to land at the first part of December, which would make for a good introduction/tie-in to the new LEGO sets, including the LEGO Atlantis sets as well as the LEGO 2010 Space Police sets that are out now in some areas. Besides the site above, you can join the discussion at the official Bradford Rant Institute of Cosmic Kinesis Facebook entry.